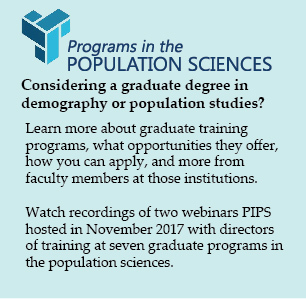 In November 2017, representatives from seven population studies programs presented their training programs in two webinar information sessions. Faculty members discussed what their programs offer, how to apply, and answered questions from interested students. Recordings of the two sessions are available below. For shorter clips of the individual representatives presenting their programs, please go to the relevant programs page.